This year, Boy Scout camp was exhausting (wait? Isn’t it every year?). Mornings began around 4:45 AM as we jumped in the pool for Polar Bear swims or the Tenderfoot Run around camp, and ended at 10 PM (or later) with evening campfires and Cat Eye hikes. One thing that I looked forward to every day was sleeping in my hammock. This year I brought along a variety of hammocks, thinking that some of the scouts or leaders may want to try one out. My troop loves the Tentsile Stingray “alien tent,” which had to be used in turns during the week because of high demand. I also strung up the DD Jungle Hammock, Eureka! Chrysalis Hammock, and the brand-new Hummingbird hammock single for different members of the troop to use. One of the positive feedback items from the troop’s review of camp was to ditch the on-site platform tents and just use hammocks. Sounds good to me! This year, my 11-year-old son joined me on his first summer camp. I had just been shipped the two-person Clark Vertex Hammock to review for my book and I was eager to try it out with my son. We spent the week in the Vertex and enjoyed out time together. The Clark Vertex Hammock is a two-person hammock, designed around two Mayan-style hammocks connected together by a fabric spacer and enclosed with an integrated, zippered bug net and weather shield. 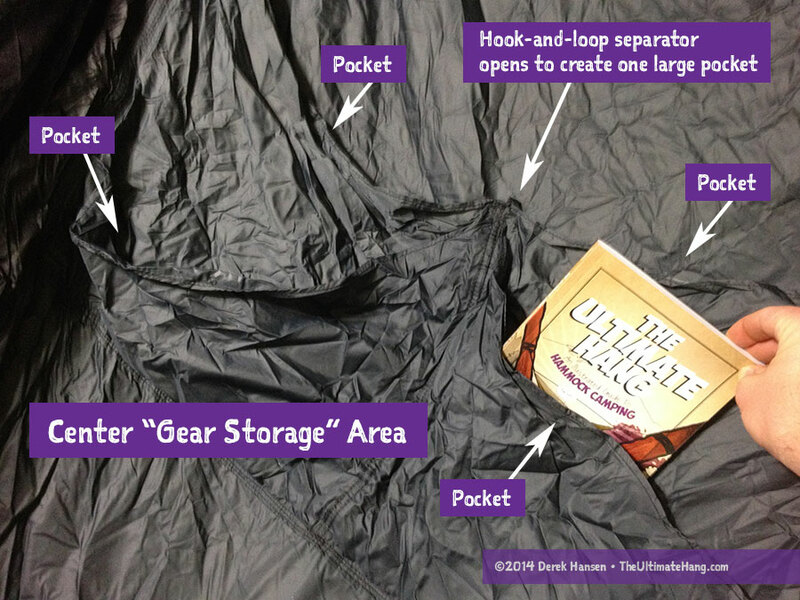 The fabric spacer has four main storage pockets. 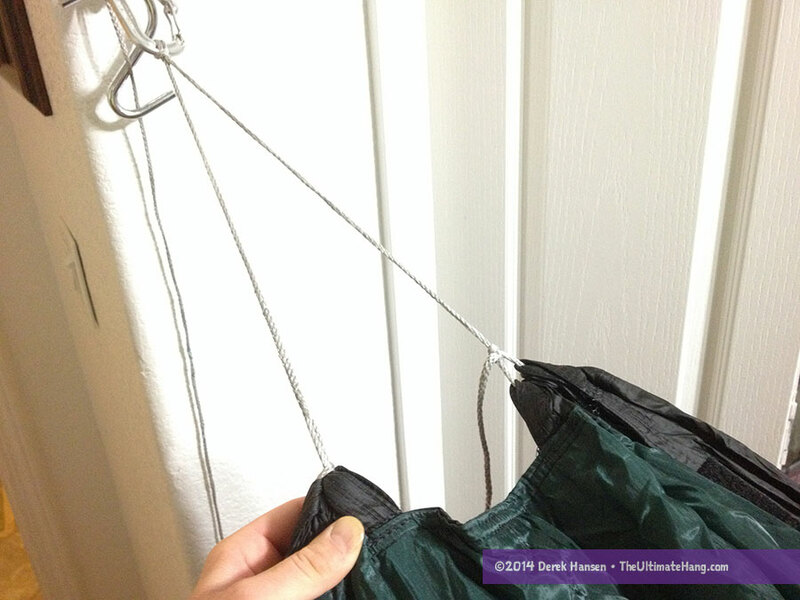 Two of the pockets are separated by a hook-and-loop fastener that can be separated to make one large pocket. The bug net and weather shield are held up above the head and foot end with small-diameter, segmented, fiberglass tent poles. These poles help create a spacious interior but are not required to pitch the hammock. Tie-out points both inside the bug netting and outside allow the fabric to be pulled out without the tent poles to save some pack weight. 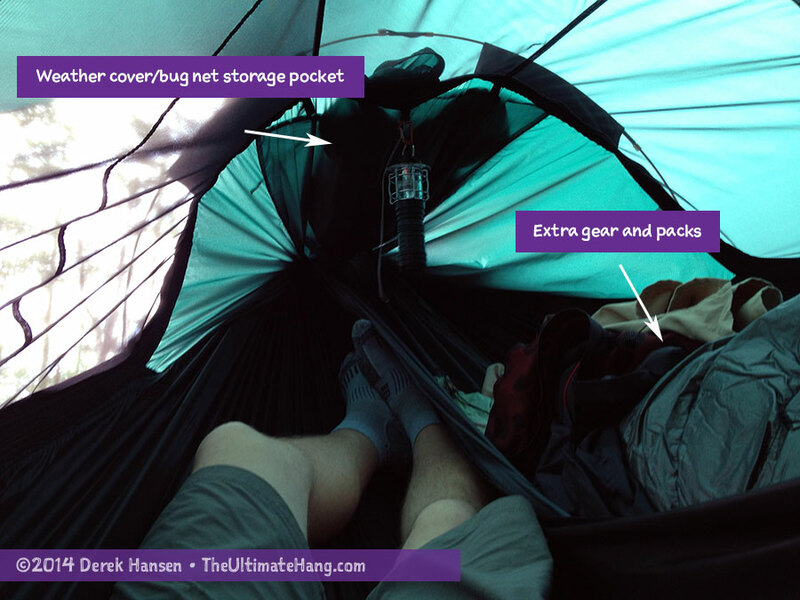 A large outer storage pocket is present on the lower foot area of each hammock, and a pouch is located on the top foot end of the hammock to store the weather shield and bug net if not used. A separate tarp protects the hammock from the elements. The overall build quality and construction is excellent: the stitching is even and consistent and the fabric is high-quality. The hammock comes with a multi-page owner’s manual showing how to set up the kit for optimal performance. When going through the package, the only thing that appeared missing was webbing straps for the trees. I was disappointed with the included suspension rope, which is polypropylene based and has a cheap plastic feel. It’s a three-strand, twisted poly rope. Compared with the rest of the hammock, this was a low point. The instructions indicate using the poly rope as the suspension system by wrapping it around the tree. While this technique may work with some anchor points, it is a no-go for trees. The poly rope is also resistant to knots and Clark secured them with bread twisty ties until the knots “set” under weight (the twisty ties are only meant to be a temporary hold and should be removed once the suspension has been used a few times). The poly rope does have other advantages: it has a lower stretch than nylon and is resistant to wicking moisture. The stiff rope also doesn’t bind as easy when knots are used, allowing you to untie a lash or knot more easily. In talking with Clark, they admit that the poly ropes are designed to reach a broad customer base who may not have any prior hammock experience. The ropes provide a baseline suspension. They’ve also designed the suspension so it can be easily removed should you want to swap out for any preferred method. One of the first things I did was remove the poly ropes and replace them with continuous loops of 7/64″ Amsteel. These continuous loops allowed me to use a variety of suspension systems. On the foot end, since the two hammocks converge to a single point, I connected a single loop of Amsteel together on a ring or carabiner to make set-up a little easier. This is the foot end where the two hammock ends meet. I used a single line to connect these together and tied a Lark’s Head in the center of the line directly on to a carabiner. Since I didn’t need the weather shield, I unzipped it to the foot end and tucked it away into the storage pocket. A closer view of the zippers and stitching. This is looking over the storage pocket for the bug netting and weather cover. 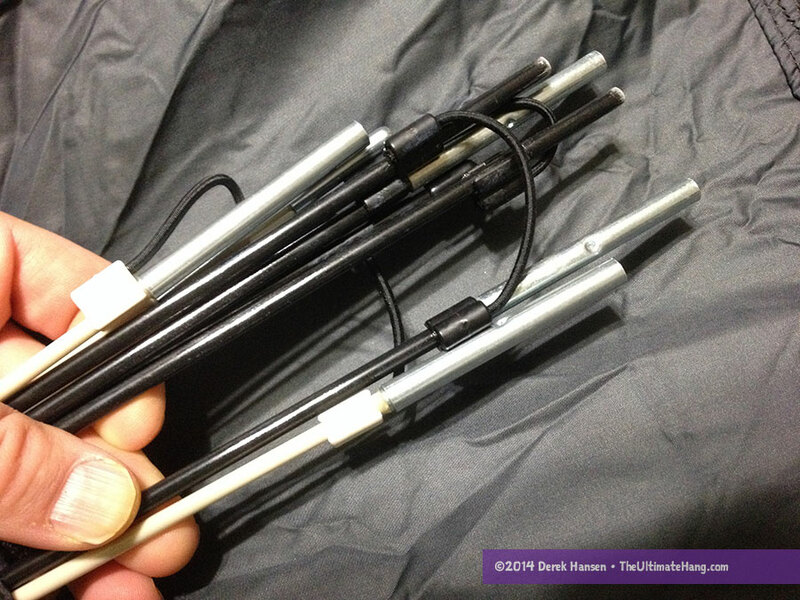 The tent poles use a unique connection system since the diameter is so small. I haven’t seen tent poles this small; it’s very cool. The longer pole on the head end kept separating, so I super-glued the shock cord segments so they would stay together. I’ve been told that all the new models the pole tips have all been glued at the factory. Clark has really pioneered the use of segmented tent poles in their hammock designs, but these have been carefully crafted to provide just the right amount of lift without really requiring the structural support you need on a tent. The smaller diameter allows the fiberglass poles to flex more as you move in the hammock, thus lowering the strain on the fabric. I guess it would be fair to call these hammock poles, since they offer a similar yet distinctive role compared with tents. Besides the Clark hammocks, there are only a few hammocks on the market that use integrated weather shields to convert the hammock for 4-seasons. The weather shield encloses the top of the hammock creating a more tent-like capsule to retain heat around the occupants. The shield also helps block any wind or air circulation that the tarp cannot. This is really nice feature to have in an all-season shelter and a welcome component to the Vertex. After a week of using the Vertex, one worry I have is the sharp corners along the zipper where the bug netting meets the hammock body. There was a lot of strain on the fabric right where the zipper turns. I’ve yet to try the Vertex without the tent poles, but I speculate that if I remove the poles it will help reduce the strain along the zipper line. I didn’t experience any failures on the zipper or create any tears, but it was difficult to pull the zipper around the corner. Strain on the zipper is due, in part, to how the Vertex is hung. With this test trip, the trees were not very cooperative in providing three perfectly spaced trees. The distance between them was longer than desired and I had to climb higher up on the trees to set an anchor point. 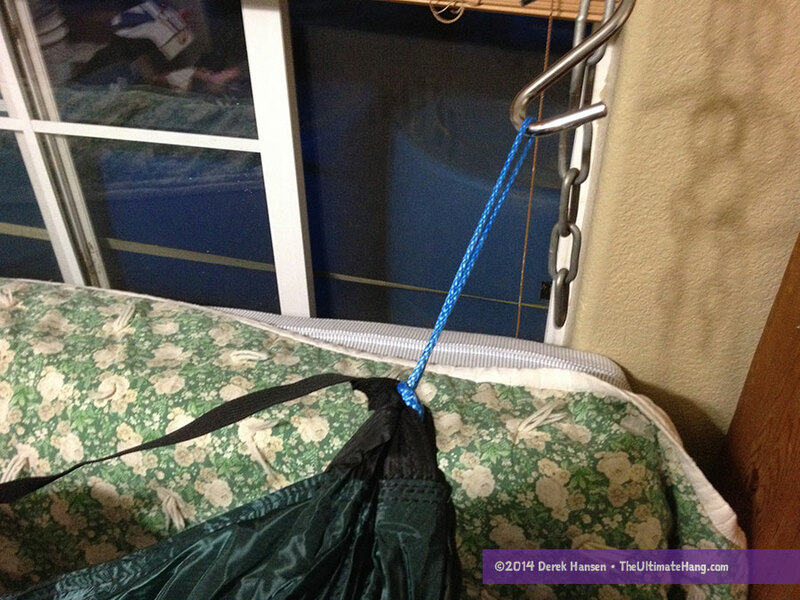 While the hang itself was suitable, it wasn’t ideal for the Vertex, and since there is no ridge line to keep the hammock in an ideal sag, the further apart the anchor points, the more the hammock will splay, which puts more strain on the zippers for example. In talking with Clark, they highly recommend looking for locations that have trees closer together to achieve an optimal hang. The outer storage pockets are large enough to hold a pair of shoes or boots, but I just used it for holding unused stuff sacks. These pockets end up being around my upper leg and knee when I lay in the hammock. The pockets are gusseted and have ample room for gear without impacting the lay of the hammock. The inner shelf has a listed weight capacity of 150 lbs (68 kg), so my son and I placed our packs and gear in this area, keeping it protected from the elements and bugs. Interestingly enough, when this center area was loaded up with our gear, it made my sleep less comfortable. All the gear really loaded this area down and negatively affected the way the hammocks performed. I finally removed most of the gear and got a much better lay in my hammock bed. I was really impressed with the tarp included with the Vertex. The deep green hue is very attractive; it’s a shade I’ve not seen with silnylon. The tarp has a rectangular shape with six side tie-outs and two ridge line points. Hook-and-loop fasteners line the peak sides of the tarp, which I’ve guessed can be used to seal closed the ends, much like doors, if pitched correctly. Because of the tent poles, I had to pitch the tarp fairly high to clear the top of the hammock. This is actually one thing I like about hammocks verses tents: I was able to easily walk under the tarp without ducking or crawling. 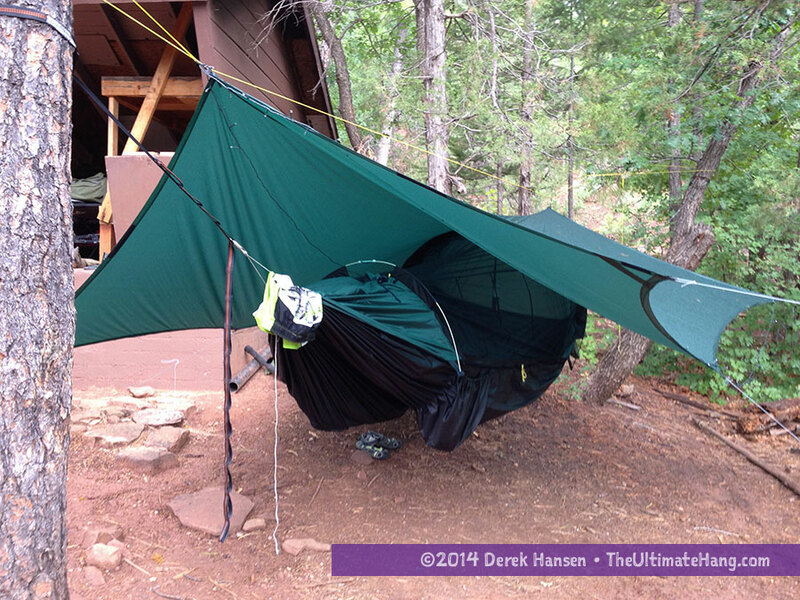 For better weather protection, primarily in the winter, pitching a tarp lower to the ground helps prevent drafts, but the Vertex with tent poles makes it difficult to do this with the stock tarp. Removing the tent poles and just using a guy line to hold up the bug net allows the tarp to be pitched much lower, if needed. However, combined with the weather cover and pitching down the corners, there really isn’t a huge need to lower the tarp. With two separate hammocks, my son and I could enter and move without disturbing the other. I often went to bed after my son, and when getting in, I never shook his side or made him wake up. As I mentioned before, with the center panel loaded with gear, I wasn’t able to get the best lay, but when I removed the heavy gear, it worked out much better. In my testing, I noticed that if both occupants sleep in the same diagonal direction (e.g, feet to the right, head to the left) it reduces interaction at the foot end (feet colliding) and improves the lay for both people. The hammock beds themselves are typical. I’ve pitched two tents side-by-side before, much like how the Vertex is set up, but I found some challenges when setting up the hammock at camp. You’d think that with a forest full of trees (or in my case, a particular camp site), it would be easy to find three trees that would work, but it proved harder than I thought. The Vertex cannot be set up if the two trees on the head end are too far apart (width) for fear of ripping the hammock apart. If the trees are closer together, that is fine; it just means the center panel is not taut, but it still works as a storage area. Illustration courtesy of Clark Outdoors. Used by permission. 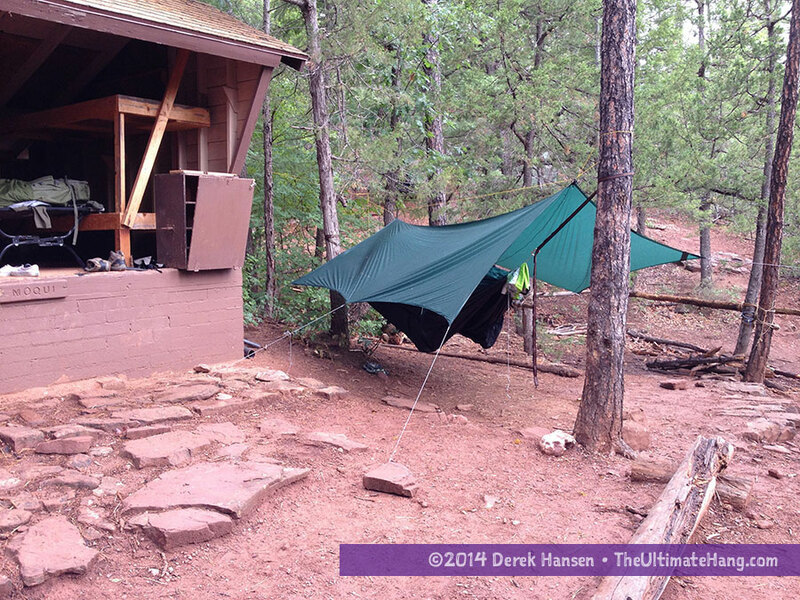 Set-up on the Vertex was more difficult than using two separate hammocks, but I really liked having an enclosed space that my son and I shared together. It made it more convenient to stay protected from the bugs, and being so close, we could talk and feel close even though we were in separate beds. Upgrading the suspension system really improved the setup time and usability, plus I could use tree straps; a necessity in many areas. The Vertex is really a great hammock, especially if you are looking for a two-person hammock that has the feel of a sharable tent space. The “table” area in the middle is a nice touch and a convenient place to store small odds-and-ends. I wouldn’t recommend putting anything large or very heavy in the middle because of how it makes the hammocks change their lay. Cardiac Hill, huh? I feel for you brother.Which week? We were week 3 site 13. I brought my ENO double-nest for naps and book reading. If you don’t mind the mice crawling on you at night, the adirondacks aren’t bad. At week 3 we were hitting the mid-30’s at night, so it was a bit chilly for my hang. We were in session 7, the last week. We had a few adult leaders in the adirondack who got “mixed.” I had multiple under quilts to keep everyone toasty in the hammocks. Have you done a review on the Hummingbird Hammock? I am curious. Their weight limits and even their suspension is interesting. Coming soon. I have 3 of their hammocks. The first were prototypes that I was doing internal reviews. Clark actually does have something like this — a webbing strap between the two points, but it is a stop gap. The hammock isn’t designed to be pulled apart so dramatically. Thank you for the review.. I’ve searched high and low for a good review of the Vertex. My wife has interest to go packing and camping with me.. Having this as an option means she can feel safe.. Though the cost is a bit high, it does seem to be worth it for the safety feeling of a loved one. You stated finding 3 trees can be difficult. If the trees are some ways apart, but lined up perfectly, have you tried or had to use an VERY long strap to hang it? What option did you choose and work with mounting? I’m already set to order this and I have amsteel blue to make my endless loop as I did for my ENO. Yes, you can do long hangs easily if the trees are in line. Just use long straps or other suspension to span the distance. I used a whoopie hook suspension, which is lightweight and can be made pretty long. If say, my wife and I were to use this hammock together, would it be bad parenting if our two year old daughter was to sleep in the center gear shelf? If she could, we’d all get a better nights sleep. Looking at the pics it’s not clear to me if we could safely and responsibility do that. It’s technically possible, and I’ve thought of doing the same thing. The trouble is that you have to have a near-perfect pitch where the hammocks are pulled apart just right because that center section is kind of like “flex” space that will move around as the hammocks move. I notice that you have both top and bottom pole lines? My vertex doesn’t have both… is this a prototype or a newer version? My flex 180 has both and I love it vs the just one pole system. It’s a guess — mine is a brand-new Vertex, so it may be a new version. 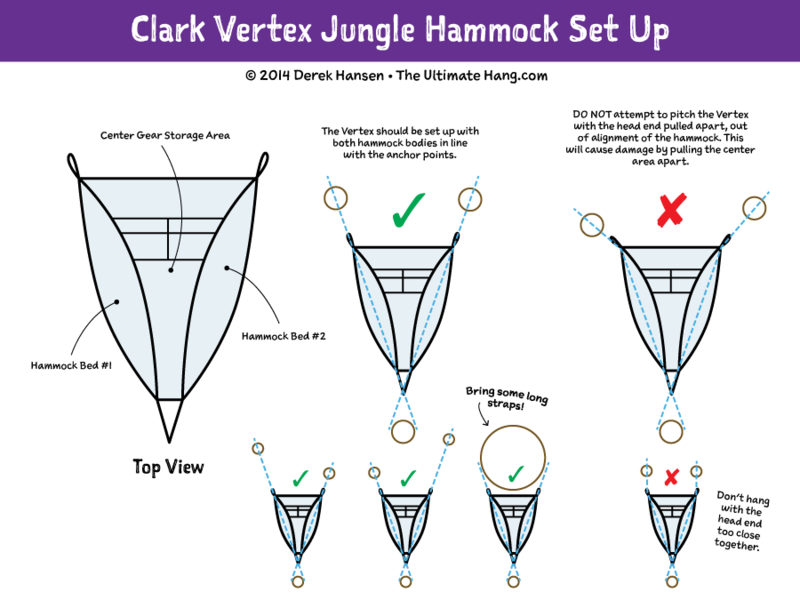 I watched the clark video of the vertex on their site and it looks very slick. Yet i don’t see it being very practical for any kind of outdoor camping. The price is high, the weight, and the set up sounds laborious compared with any kind of solo hammock. Finding two well spaced and sited trees can be a challenge at camp sites at times so I can see this being even harder needing the perfect triangle of trees. I can see the benefits of being together with a loved one however hanging in hammocks is a solitary affair. Hanging hammocks really close to each other ( side by side or bunking two or more hammocks) is usually enough. Did you notice the hammock squeezing in on your shoulders and body? I didn’t notice it much when I hung it with the right distance/angle in a controlled area in my hammock lab. Out in the field it wasn’t so easy and so the two of us had to work it out a little. I think my son faired better than I did. The hammock isn’t that large, so if you are tall and wide, it may very well feel tight inside. It doesn’t offer as much room as bigger hammocks; a trade off on the design. It may be that you look at going back to single hammocks and sharing a tarp over the top of you both. I am 6’1 170. I really do hope it is better in the woods. I am going hiking this Friday with my 9 year old. When me and my wife tested it out here like i said there was only 1 area that was possible to set up. However it seemed to be pretty close to what they recommend as the ideal configuration. But we both immediately noticed how confined we felt at the shoulders. When you would lay completely down the hammock would just about completely close above you. The only way i found to stop this was to lay sideways and use my body (knees in fetal position) to push against the hammock… It isn’t a big deal for sleeping but I had hoped to hang out in the hammock at night, maybe watch a movie on my tablet…. There video title that I watched several times before purchasing claimed real comfort for two people. So I guess I maybe got more excited about this “comfort” then I should have. Again maybe it was just that one configuration… I’ll report back after the trip. You may also try pitching the foot end a little higher than the head end and see if that helps keep you set. That said, the Vertex does compromise a little on size as a tradeoff for weight — it is a big kit. The solution to your problem is found on the set-up video from Clark. If your shoulders feel squeezed it is because you have hung the hammock too taut between the trees. If you hang the ropes a little higher and then give the hammock a little more slack, the beds relax and feel great. This is easiest when you choose trees that aren’t more than about 18 feet apart. If the trees are very far apart (from head to foot end) then most people think they should just pull the hammock tight to keep it off the ground. This makes it uncomfortable. Instead, raise the ropes as high on the tree as you can and then give it some slack to make it feel comfortable. Me and my wife have done this and it is the best sleep we’ve ever gotten camping. Have fun! Derek … Lots of GREAT information here. I just ordered your book on Amazon and can’t wait to read it, I know I will learn a lot. My wife and I just purchased the Clark Vertex and we’ve yet to have the right weekend to try it out, but will soon. One question: Most likely I’ll be taking the rope that comes with the Vertex out and replacing that with four Amsteel Loops, along with a four carabiners and Atlas Straps. What do you feel would be the best length for the Amsteel Loops to be? Thanks for any advice you might offer. I am fairly new to the whole hammock scene, I am 6’2 and 250lbs, been a camper for years but being a side sleeper I have begun looking for alternatives to the ground… The girlfriend and I would love to get one where we could be together in the same shelter… Is side sleeping possible in the vertex? Yes. It is a unique shelter. You can achieve the same concept with two single hammocks pitched close together under the same tarp. At your height, you may be pushing the limit of the vertex. Do you have any recommendations on a hammock system that will work for someone my size and sleep position? And also thank you for all the info, will definitely be buying your book here soon! Any hammock will allow you to sleep on your side. As for big and tall, there are basic hammocks like the Hammock Bliss Triple, the KAMMOK Roo; jungle hammocks like the Warbonnet XLC and the Hennessy Hammock Safari. Is there any other two person hammocks you have tested that compare to or are better than the vertex ? Not really. The only other comparable option is the two person hammock from Tentsile. They are fairly different though so a direct comparison probably isn’t advisable, unless you are car camping. I may have missed it. Do you still suggest hanging this at 30 degrees? Clark site wants to lead you into mounting the traps pretty high and a steep angle. Thanks, I am on the verge of ordering. 30 degrees is a good starting point. Adjust from there for better comfort. Just wondering if for instance you had 2 trees that were too far apart on the head end, would it be acceptable to tie the 2 ends together, about halfway between the hammock and the trees to bring them back to the proper angle? In my mind if you rig it right, the straps(and additional rope) should take all the stress. He is 6’6″ and about 230 pounds. On the website for this hammock his point on the height to weight ratio lists him right on the edge of comfortable and less comfortable. He touches head to feet in our tent so would this be about the same? We have a dog that is about 22 lbs that we take backpacking with us. Would she be able to sleep in the gear storage area comfortably? We are also about to add a second dog, so would two dogs (total weight approx 50 lbs) fit in the gear storage area? I am not a fan of storing gear in that area since we backpack in bear country, so the dogs would be the only things occupying that space. I hunk you’d find the Vertex too small and confining. The middle gear area would hold your dog. The vertex has an appeal for couples but owing to his height I would recommend an 11 ft hammock for him and a separate hammock for you. Share a tarp and stay close together. Dream Hammock has a lot of custom options for a hammock with big netting. The winter dream tarp from underground quilts gives a lot of shelter and privacy. In theory couldn’t I just bring a strong telescopic pole backpacking and tie around the ends of it ,from the 2 corners(head).Then from the center of the pole tie around a tree which will still allow you to only use 2 trees instead of 3? Do you think that in situations where you can’t find the perfect trees for the head section, that you could connect the rope/straps around two trees that are too wide, give it some slack, and then use some spare rope to tie the two pieces of rope to a more optimal angle? It gets tricky when you do set-ups like that, but there are other possibilities.